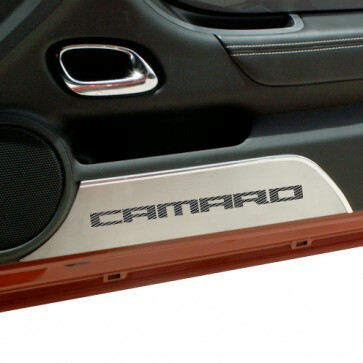 These brushed stainless steel door panel kick plates add a clean, modern look to your Camaro with their carbon fiber inlays. Made from 100% stainless steel, they will not tarnish, fade or rust. Easy "peel and stick" installation takes just minutes. Fits all 2010-2013 coupe and convertible Camaros. Made in the USA. Set of 2.